This is the first page of the Set Three pentatonic scale-tone practice patterns - exercises Nos. 1 to 10. 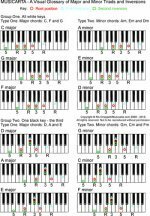 They are all in the all-white-key pentatonic major scales C, F and G.